Part two of The March on Canterbury. Who will rid Conrad Kinch of that turbulent priest? The culmination of a VBCW set of scenarios. Colin Ashton explains the changes in his life, gaming and otherwise that he had to deal with. Jon Sutherland gives us part one of a set of rules for gaming the Indian Mutiny. Jon has tested these scalable rules out over the years with groups – and battles – of various sizes. The second of a two-part article: Stephen Jones gives us a set of rules for modern era, small unit actions: this time AFVs and heavy weapons. This month Fantasy Facts has its usual round up of what’s new in non-historical gaming; with reviews on products from Brigade; CP Models; Osprey; Crooked Dice; Freebooter and GZG. 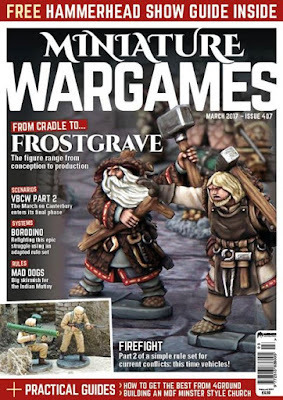 In addition, there’s an interview with Nick Eyer explaining the design and production process of figures in the Frostgrave range plus a building piece by Roger Dixon on customising 4Ground scenery for Sci-Fi games like Infinity or Mercs. Adapting the Bloody Big Battles rules – designed for late 19th century games – to play that pivotal moment in Napoleon’s 1812 campaign. What to read and why for wargamers. Books topics include: Kursk; 21st Century Navies; Rhodesia’s Grey’s Scouts; Russian Snipers; ACW (via Lincoln’s Scandalous Secretary of War); Vietnam; Austro-Hungarian WW1 Cruisers; Tigers in Combat; the 1940 Invasion of Norway; German Assault Guns; and The Liberation of Europe (in photos). More tea Vicar? Diane Sutherland building an MDF church and shows how to get the best from it. The Tin Soldiers of Antwerp are not just the people that run the Crisis show: they have lots more to offer (including a club house with a bar!). Plus – as a FREE extra – the Hammerhead Programme with floor plans for both halls and all you need to know to navigate the show including details on 70 all-participation games and 56 traders!